As part of the ongoing Bike Lab project, I built an analysis platform to examine street networks and census data for cities across the nation. 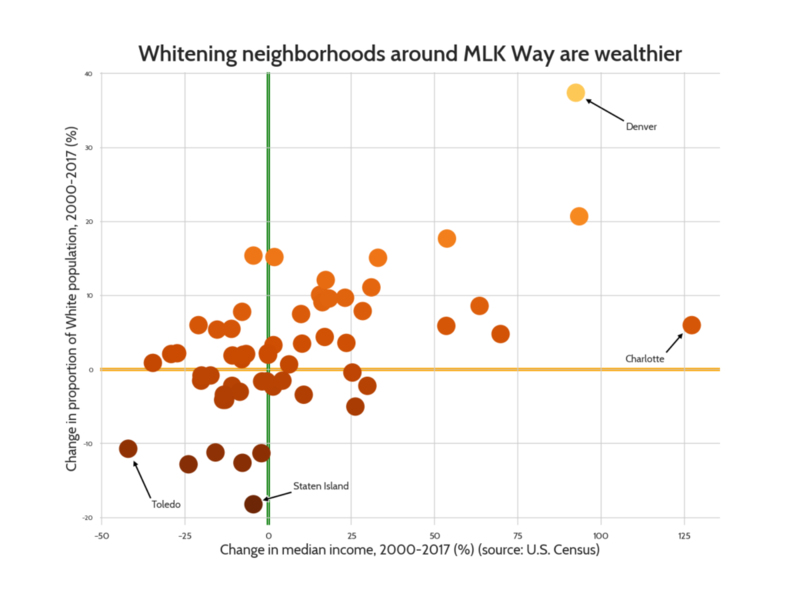 Selecting streets named “Martin Luther King”, I gathered street network and Census data from 2000-2017, identifying trends in demographic change, income, and cycling rates in historically Black neighborhoods. In a 10-part series of data analysis and commentary, I developed a neighborhood change taxonomy, showing the differences between gentrification in large coastal metros, displacement without development in the Rust Belt, and resegregation in smaller border state cities. This work was performed primarily in Python, with some maps generated in QGIS.